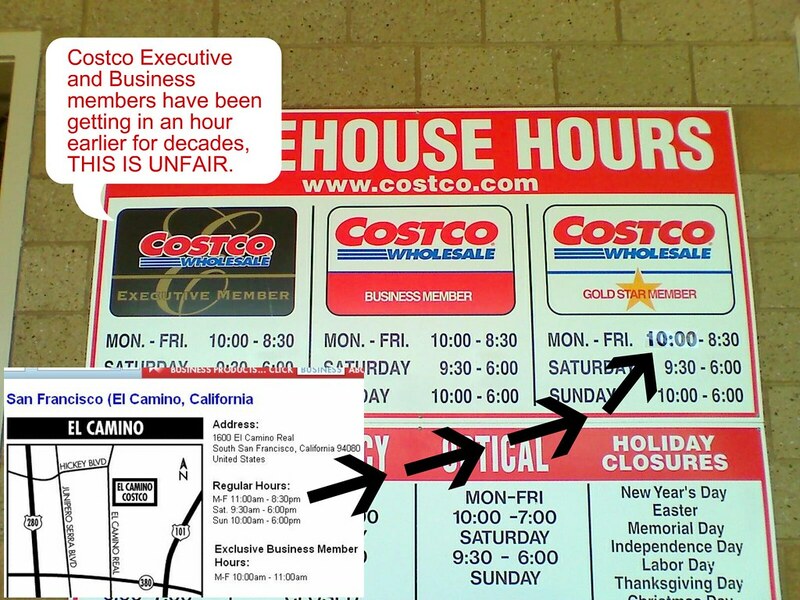 If you love Costco and have an Executive or Business membership, I've just noticed while at my local Costco warehouse (El Camino Real, South San Francisco #475) that the "Executive Business Member" early hour privilege is now revoked because they now permit all GOLD STAR MEMBERS to enter at the same time as the Executive and Business folks. The photo was taken today (9/26/08) and the time was changed no less than a week ago. That's why the time was changed by taping it over. This is frustrating. I upgraded my membership less than three weeks ago to Executive and paid an additional $50 for this special privilege of shorter lines, smaller crowds, and first dibs on the best stuff before everyone else gets their hands on it. The 2% rebate return won't likely get back that extra $50 fee (I usually spend less than $2,500 in a year), but just paying a little more for smaller crowds is a big pleaser in my book. For Business members, I feel they are getting it quite bad: the early hour before the general public (Gold Star) gets all their restaurant and business supplies is a huge benefit before a huge mob swamps the warehouse, and they can literally get in and out of the warehouse even before the clock hits 11AM. I even asked one of the employees, and she gave me this lame answer that "it's for the holidays." Um... it's only SEPTEMBER! Christmas is still a long ways away. I just called one of the managers of that Costco location and they claim that the executive management of Costco wanted this change, so it sounds like the management of the warehouse did not make the recommendation. The high management also stated that people who upgrade from Gold Star to Executive really like the Executive program, but paying extra should also give that special early hour too! I expressed my concern to the manager on the phone and also noted to the person that it was much more crowded and the lines were much longer today than I have ever experienced before. And I don't understand, Costco has ALWAYS been giving the special early hour to all Business members for DECADES. Executive members paid an extra $50 for the special privilege too (Executive membership was not created until much later) and it's been going strong for a long time. But now they let the regular Gold Star members barge through the Execs and Business folk's fun? Call (650) 757-3003, press "1," and ask for a manager. UPDATE/FYI: Before you start complaining, this article was published in 2008 and was resolved a week after this posting. I'm thrilled that I no longer have to wait until 11:00am to get into Costco. I have two kids in preschool and a two year old. Depending on the crowds, it can be really hard to get in & out of there in time to pick up the preschoolers back in the Sunset. It is hard enough to shop with a "baby" and there is no way I'm doing it with all three at the same time and I NEVER go on the weekends. I have no problem with the earlier hours for businesses. I think they should have them. As a previous owner of a small business, I needed to be at my business at 10:00am and would have much appreciated access to Costco earlier in the day at possibly 8:00am or 9:00am. i'm glad I saw this, b/c i was considering executive membership but haven't seen the time benefit over the regular membership. HOWEVER, you DO have a choice to downgrade it. The manager at your Costco didn't tell you, but the website of Costco did say that (http://www.costco.com/Browse/ProductSet.aspx?Prodid=24743&whse=BC&topnav=&browse=&lang=en-US) you can "Shop Confidently" "We will refund your membership fee in full at any time if you are dissatisfied. " So there, you can get your full $100 refund, AND you can decide whether you ever want to rejoin again. or just downgrade back to $50. hope this helps. We joined Sam's Club a year ago when we needed furniture in September because Costco had already removed furniture from the warehouse to make room for Christmas items. We have found that Sam's Club has comparable items at lower price - and Advantage Plus (similar to Executive membership) will get us into the store at 7:00 a.m. There is coffee and bakery treats just inside the door. In the last year, we have spent more money at Sam's than we did at Costco. Better wake up Costco; Sam's $100 Advantage Plus membership is a better value than the Costco Executive membership. Because I have leukemia, my oncologist told me to avoid crowds where I might catch something that will advance my leukemia. We really like going to Sam's at 7:00 and having 3 hours before regular members are admitted. Everyone of you executive and small business card holders hold the power in your hands. As the person above said, you can cancel your membership and get a refund of your dues paid. With that money go to get yourself a Sams membership and enjoy the 3 hour early shopping every day and the savings. If only half of you cancel, Costco would get the message and change their policies. I did not renew my membership about 18 months and have been a Sams Club shopper. I only wish more of you would do the same, so I could choose to feel like my money spent with a Costco membership would be worth it. I have an Executive Costco membership. It started out a business membership, but when I dissolved my business they let me keep it oddly enough. We upgraded to Executive a few years ago. I miss the earlier hour shopping. It was so nice to have short lines. We avoid the place most evenings, weekends, and holidays. Sam's Club was nice, too. I found it quite comparable to Costco. I had a business membership for one year when I lived in WI. We don't have SC where I live now. None in the state. Early hour shopping would be nice to have again. There are reasons for paying more for better membership perks. When they start taking them away it almost isn't worth the price. BART Station Agent Parking - Abuse of Powers?